When consumed in small amounts, red wine can be considered a superfood. Over the past few years, wine has become more than a simple Saturday night pleasure. It has become a real passion. After extensively reading about wine, my main takeaway was that moderate consumption might be a healthy habit. Evidence suggests that it may help people live longer, protect against certain cancers, improve mental health, and enhance heart health. Taking advantage of the health benefits of red wine is not a new practice. Research conducted at Harvard University found a jar in the tomb of King Scorpion I, dating back to 3150 B.C., that contains traces of wine along with herbal residue. Based on the findings, researchers attest to the great antiquity of Egyptian herbal wines as medicine and their importance under the pharaohs during the country’s initial unification. Thus, when consumed in small amounts, red wine can be considered a superfood that provides powerful antioxidants that heal the body at a cellular level, like quercetin and resveratrol. That’s why the benefits of red wine are so plentiful when you consume it in moderation. Château Troplong-Mondot: A St. Emilion winery that has been producing wines under the 1er Grand Cru Classé B status since 2006, this hilly estate owes its ascendance to charismatic long-time owner Christine Valette, who ran the property from 1980 until her passing in 2014. Its charming château dates back to 1745 and has 30 hectares of vineyards well-sited alongside the hill of Mondot. The soils are rich in limestone and clay and are planted with Merlot (85%), Cabernet Franc (2%) and Cabernet Sauvignon (13%), producing a fresh and supple red wine typical of the top estates in the St. Emilion area. Château Angelus: One of the largest and most prestigious St-Emilion estates which was promoted to the coveted 1er Grand Cru Classé A status in the 1996 St-Emilion reclassification. Angelus’s vineyards, 39 acres, enjoy a perfect southerly-exposed slope – Cabernet Franc (which makes up 47% of the property) is grown at the bottom of the slope, where the soil is sandier and warmer, while the Merlot (50% of the production) is grown in the limestone-rich clay soils at the top of the slope. The wine is matured in 100% new oak for 18 months. The wine is rich, concentrated and complex. It’s position as one of only four St. Emilion estates with the Classé A status is wholly deserved. Château Lafleur: A tiny 4.5-hectare Pomerol property located a stonesthrow from the storied Pétrus. The soils here are particularly deep and are enriched by deposits of potassium and iron. Only natural fertilizers are used and yields are painfully low, even by Pomerol standards. Lafleur’s wine is typically a blend of Merlot (50%) and Cabernet Franc (50%), an unusually high percentage of Cab Franc for the region. The Lafleur estate is deceptively humble; the people behind the wines are incredibly passionate in their pursuit of world-class winemaking, and it shows in the end product. Contrary to many Bourdeaux estates, there is no grand driveway or opulent tasting room here. 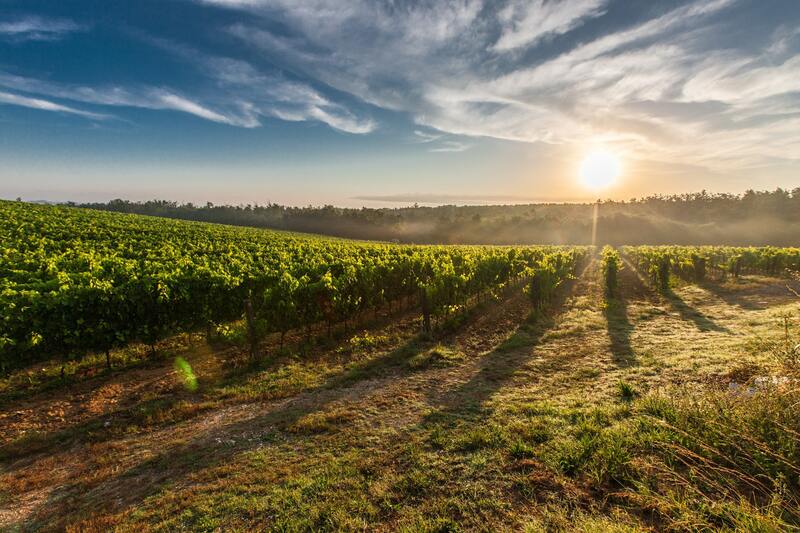 Luxury marketing is completely eschewed in favor of a singular focus on releasing the full potential of the unique terroir of the Pomerol plateau to produce an unforgettable product. Wines from Lafleur display a spectacularly intense perfume and layers upon layers of concentrated, black fruits, minerals, tobacco spices and creamy liquorice on the palate. The wine is uniquely intriguing. No doubt a regular dose of it would do wonders for the health – if you can afford it. Chateau Margaux: One of the five First Growths ranked in the 1855 Bordeaux Classification, Chateau Margaux has been well regarded in history and stood among Thomas Jefferson’s favorite chateaux. The vineyards are primarily Cabernet Sauvignon (75%), with the balance composed of Merlot, Petit Verdot and Cabernet Franc. In addition to the chateau’s grand vin, the estate produces a second label called Pavillon Rouge de Chateau Margaux and Pavillon Blanc de Chateau Margaux. Margaux wines are renowned for their perfumed elegance and ability to improve over time. Their impressive “library” boasts Chateau Margaux wines dating back to 1845! Château Palmer: Named after a British officer, Major General Palmer, who settled in Bordeaux in 1814, it is located in the center of the Margaux appellation, and its vineyards (Cabernet Sauvignon 55%, Merlot 40%, Cabernet Franc 5%) lie on a sparse gravel plateau. Palmer’s relatively high Merlot content makes it the closest in style of any leading Médoc properties to the great wines of Pomerol and St-Emilion. Chateau Palmer is aiming to achieve full organic and biodynamic certification, an impressive commitment in the region, especially for a wine of that caliber. This effort can mean increased volatility in the yield of the estate’s production, but the Palmer team pushes on and is achieving exceptional quality in the wines even with these more trying production techniques. Château Pichon-Longueville Baron: A leading Pauillac 2éme Cru Classé estate, which is one of Bordeaux’s most illustrious “super seconds”. In 1987, it was bought by the AXA Millésimes Group, an offshoot of the French insurance giant AXA. Pichon-Longueville-Baron’s 73-hectare vineyard (70% Cabernet Sauvignon, 25% Merlot, and 5% Cabernet Franc), runs adjacent to that of Château Latour and lies on deep gravel beds. The Cabernet-dominated Pichon-Longueville Baron is a more muscular, tannic and full-bodied wine than that of its neighbor across the road. The grand vin (“great” or first wine) was simply unforgettable, not unlike the beautiful estate itself. Château Léoville Barton: It is the smallest portion of the old Léoville estate and has been owned by the Barton family since 1826. Léoville Barton’s 48 hectares of vineyards are located in the east of the St-Julien wine appellation and lie on gravelly-clay soils. They are planted with Cabernet Sauvignon 72%, Merlot 20%, Cabernet Franc 8%, and passionately farmed by the Barton family, who still manage the daily operations of the estate. The wines here have a distinct style, somewhat more acidic and fresh than their neighbours in the tiny St. Julien subregion of Paulliac. If you are in the area, checkout the two following hotels and restaurants below. I promise, you will not be disappointed. The Château Grand Barrail Hôtel: This hotel is an elegant 19th-century castle, in the midst of the vineyards of Saint-Emilion. I really enjoyed saying in one of their gorgeous and comfortable guest rooms overlooking the hotel’s beautiful park. The service makes this breathtaking hotel the perfect place to stay when traveling in the region. The hotel also has an elegant restaurant where you can taste some of southwestern France’s most inventive cuisine and finest wines. I had a chance to dine on the terrace of the restaurant, where I was treated to a clear view of the park and vineyards nearby while watching the sunset. Finally, the hotel has a beautiful spa overlooking the vineyards that I highly recommend. The Château Prieuré Marquet: Located north of Bordeaux, near Saint Emilion, this elegant Castle is simply exceptional. The large terrace of the castle with its stunning swimming pools overlooking the property’s vineyard, is the perfect place to enjoy tranquility and truly disconnect. There, you can enjoy one bottle (or two) of the hotel’s delicious own wines. What makes this place so unique is the combination of the old and the new: A classic noble castle with rooms decorated with personalized unique modern art pieces. The spacious rooms were particularly comfortable with very high-tech amenities that you would not expect in an old castle. If you’re a nature lover, you will certainly enjoy a long peaceful walk in the well-maintained charming vineyards and forest of the property. Logis de la Cadène: Founded in 1848, this restaurant is one of the oldest restaurants in Saint-Emilion and over time has become a true institution revered by passing visitors as well as regular locals. Located on a small and quiet square in the very center of the medieval town. I really enjoyed the relaxing atmosphere combined with the tasty traditional dishes made with high quality produce. The wine list is, of course, truly rich which makes the whole experience memorable. The talent and work of Chef Alexandre Baumard were rewarded in February 2017 with a Michelin star, which is very well-deserved. La Grand’Vigne: Inspired by 18th century ornamental greenhouses, dining at this restaurant is an excursion in nature. Overlooking a small lake with swans, you will enjoy the breathtaking regional food inspired by the terroir, in a warm and comfortable ambiance. Nicolas Masse, the two Michelin stared chef, created an elegant menu combining textures, colors and unforgettable flavors. I truly hope they will get a third star soon. On top of this, the service is exceptional which makes the experience so unique. The experience would not be complete without some of the best Pessac-Léognan wines, including from the neighbor Château Smith Haut Lafitte.